This tutorial will show how you can automate the application Governance using WSO2 Governance Registry and Jenkins (for Build Automation). A svn location to store build artifacts. Jenkins or similar build automation tool should be used to build the artifact and deploy it to the specific Dev SVN location. 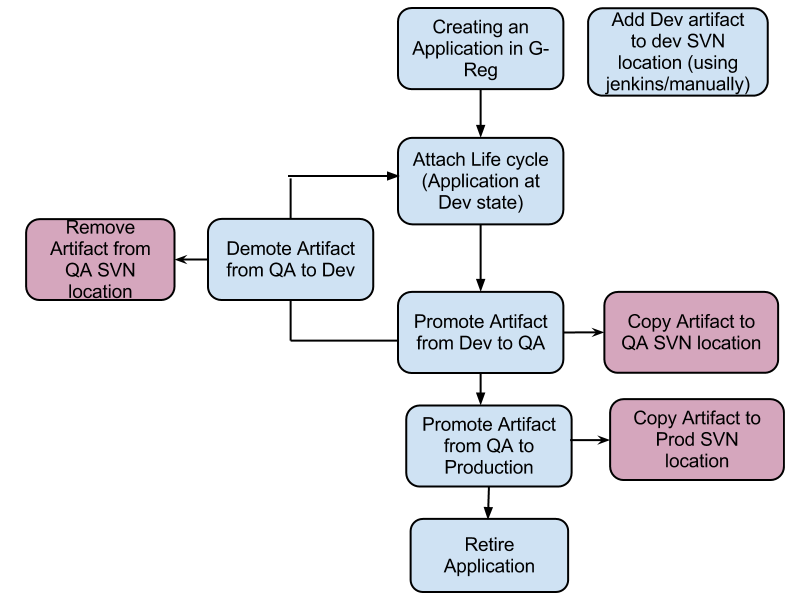 There are three SVN locations required for Dev , QA and Production artifact deployment. User needs to specify the exact name of the artifact (without the extension) as Application Name when adding the application to WSO2 Governance Registry. This particular sample is tested with WSO2 Governance Registry 4.5.1. Therefore it is recommended to use the same version of the product. Please download resources from following location. 2) Create an Application in Governance Registry. 3) Add Svn Executor to Governance Registry Server. Edit the svn-executor-1.0.jar’s svn.properties file and add your svn credentials and Jenkins URL. Copy the svn-executor-1.0.jar and svnkit-bundle-1.0.0.jar (provided separately) to G-REG_HOME/repository/components/lib folder. http://docs.wso2.org/wiki/display/Governance450/Adding+Lifecycles. Use the lifecycle configuration specified below. ~ Copyright (c) 2005-2010, WSO2 Inc. (http://www.wso2.org) All Rights Reserved. ~ in compliance with the License. In the above lifecycle configuration you need to change your svn locations that are used in promotions. 5) Attach the AppLifeCycle to your application. 6) Promote Application from Development to Testing. 1) Start Jenkins and add the URL to svn-executor-1.0.jar’s properties file. 2) Create two Build jobs with name “promote” and “demote”. 3) Apply “This build is parameterized” check box and add following parameters to each of the job separately . 4) Create a local repository (A folder in you local file system) to check out the artifacts. ## location of the local ‘QA’ artifacts are stored. 8) You need to have similar script for artifact deployment from initial project to developer location which is not covered in the sample. Published at DZone with permission of Shelan Perera , DZone MVB. See the original article here.